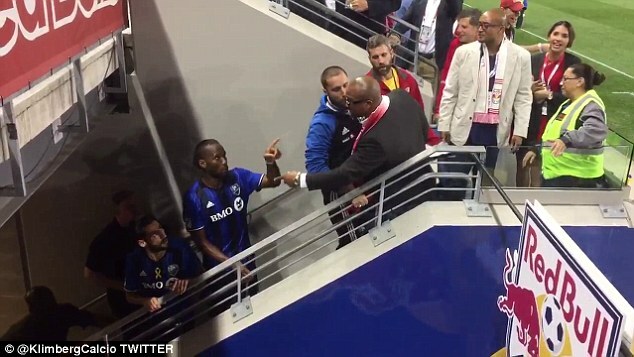 Former Chelsea striker Didier Drogba's frustrations boiled over as he got involved in a verbal confrontation with fans after his Montreal Impact side's 1-0 defeat in New York. Drogba clashed with New York Red Bulls fans after his side's tough run of form continued with a 1-0 defeat in the Big Apple on Saturday night. Security was required to keep Drogba and the fans apart before the 104-cap international, who had just one shot in the defeat, ultimately returned to the dressing room with team-mate Matteo Mancosu after appearing to apologise to other nearby fans. Drogba later spoke about the confrontation with TVA Sports in Montreal and insisted the confrontation was something of nothing. "There were two fans who were showing their enthusiasm a little too much," Drogba said. "They crossed the line a bit, that's all."